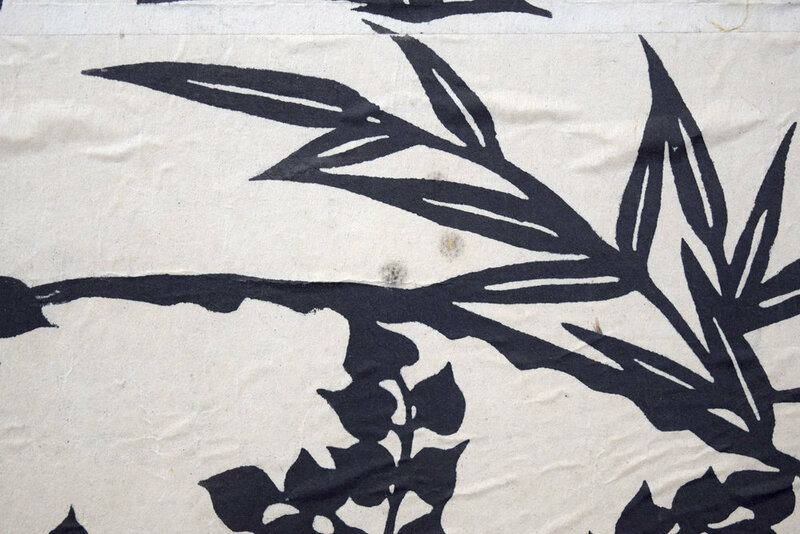 This is a very large, very rare momigami print by Japanese sōsaku-hanga artist Sadao Watanabe c. 1958. A very unsusal, oversized print. Signed/sealed in red artist chop. A delicate yet rich design of black against a white background with men, birds, and fruits in a vineyard. The work is reminiscent of embroidery or tapestry and the story is told in horizontal layers by means of figures in two's and three's as they plant, harvest and present the fruit.A trellis of fruit and pattern of birds enhance the decorative aspect of this story of harvest, symbolic of the harvest of souls. Sadao Watanabe's works are in the collections of the Museum of Modern Art in NY, Boston Museum of Art, The art Institute of Chicago and the Carnegie Museum, among others.